One of the hallmarks of inspired leadership is having the vision to proactively turn events into opportunities. Another hallmark is being secure enough to give credit where it is due. In this respect, developments over past month indicate that the leadership of the Central Tibetan Administration (CTA) still has room to grow. Certainly the CTA has undertaken praiseworthy action recently. In a recent editorial, we applauded the CTA’s Ume Lam campaign, calling it a “breath of fresh air”. Also, the Kashag’s Democracy Day statement on September 2 had a newly-declared focus on “civility” – something desperately needed in Tibetan exile polity. But while these welcome CTA initiatives have focused on internal public opinion in the Tibetan community, it is impossible not to notice a certain passivity by the CTA recently when it comes to the outside world, including China. The leadership’s inaction has been especially notable in the cases of Hong Kong, Ilham Tohti, the Scottish referendum, and the Nobel Summit. As unprecedented pro-democracy protests shake Hong Kong and the Beijing government, it’s natural that Tibetans might wonder what the CTA's position is. This is especially so when the global press is condemning the Chinese government for the “fiction” of Hong Kong’s autonomy. Yet the CTA has been silent. 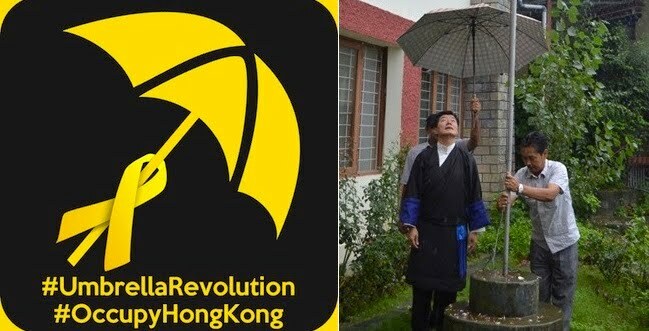 Umbrella Revolution - Photo on right courtesy of tibet.net. By contrast, the International Tibet Network issued a compelling statement of solidarity with the people of Hong Kong, as did ICT. The current CTA leadership cannot be expected to take a similarly strong stance. But the White House managed a diplomatically-worded statement of support for the "aspirations" of the Hong Kong people. And even Taiwanese president Ma Ying-jeou, usually one to seek good relations with Beijing, criticized the actions in Hong Kong and urged China to embrace democracy. Some may wonder why the CTA should bother making its position on Hong Kong known. The answer is simple: the success of Hong Kong’s "one country, two systems" model has direct implications for the CTA's Middle Way policy. Events in Hong Kong are testing how an entity under Beijing's control can exercise internal autonomy. There is a tug-of-war between Beijing's emphasis on "one country" and the protestors' emphasis on "two systems". The outcome will shape hopes for the Middle Way, since Hong Kong’s advantages make a best-case scenario for successful autonomy in China. Equally relevant for the Middle Way, according to the New York Times, “the talks [between the Hong Kong government and the protesters] provide a useful delay for the government, helping to sap the energy of the protests without promising a meaningful compromise.” Observing what the New York Times calls a “conscious element of the government’s strategy” in Hong Kong, the Tibet movement should consider how to avoid a similar trap. There are of course some important differences between the demands of the Middle Way and the Hong Kong protesters. The Sikyong has made it clear that he seeks autonomy under the weaker Article 4 of the Chinese constitution, not the stronger Article 31 that is the basis for the Hong Kong system. Also, the current CTA leadership has now modified the Middle Way to exclude democracy (the "Partial Middle Way"), whereas the protestors in Hong Kong are demanding genuine democracy. It is hard to understand the conspicuous silence coming from Dharamsala. Surely the CTA's silence does not stem from any discomfort over supporting democracy for Hong Kong, when the Partial Middle Way has renounced democracy for Tibet. Even if the CTA happens to be engaged in back-channel dialogue with China (which occurs occasionally, usually when China wants to deflect pressure on itself), it’s hard to argue that the CTA’s silence benefits anyone. On principle alone, CTA should have welcomed the Hong Kong people's desire for democracy and autonomy. Strategically, this would have shown CTA's strength and confidence in the principles driving the Tibet movement, which would have been a good thing, even in a putative dialogue with China. It would also have earned allies. After all, the Tibetan people are a stakeholder in this issue, and keeping silent on the issue has meant giving a pass to the Chinese government on whether it lives up to its promises of autonomy. How does China’s apparent refusal to abide by its own promises to the people of Hong Kong (with eerie echoes of Tibet in the 1950s), and its use in Hong Kong of talks as a stalling tactic, impact the CTA’s decision to commit all its efforts to its current strategy? It's an important question to consider, and perhaps a question that our elected representatives could have put to the Chinese leaders. As with the situation in Hong Kong, China's unjust lifetime imprisonment of Ilham Tohti goes directly to the key principles of the Middle Way. Tohti is a moderate Uyghur scholar who devoted his life to increasing understanding between Uyghurs and Han Chinese. Far from being a separatist, Tohthi was perhaps the leading advocate of the sort of sensible ethnicity policies that might improve Chinese-Uyghur relations. While other respected Uyghur leaders like Rebiya Kadeer say that only independence can protect the Uyghur people, Tohti’s scholarship sought a way for the Uyghurs and Han Chinese to live together. It was therefore an especially major blow for the prospect of Chinese-Uyghur coexistence when the Chinese authorities imprisoned him. The International Tibet Network and others issued strong statements. But this is not the same as the Tibetan government-in-exile taking action. So, given how closely Tohti’s policies mesh with the Middle Way, it is baffling why the CTA has been silent on his imprisonment. It is hard to think of anyone else in China who is a more prominent advocate of the sort of ethnic autonomy provisions sought by the Middle Way. Unless we are missing something, the CTA’s passivity seems like a strategic mistake and an unprincipled abandonment of an ally. Additionally, it would have been helpful if the CTA had explained to the Tibetan people what China’s mistreatment of Tohti (together with its actions in Hong Kong) might mean for the Middle Way. Do these developments impact the strategy or likelihood of success? Why or why not? The Tibetan people deserve to know the thinking of their elected representatives. 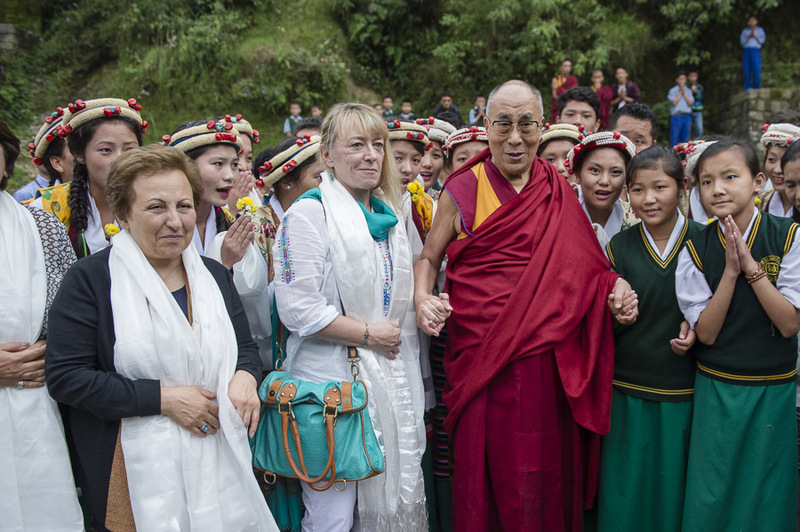 We previously wrote about the Scottish independence referendum and why it was good for Tibet. But while prominent prominent Tibet groups were using the Scottish referendum to push the Tibetan cause (here and here), the CTA was notably silent. Obviously one would not expect the current CTA leadership to have advocated Scottish independence. But it would have been smart to try to insert the question of Tibet into the conversation, as many other groups did. Even under its current policy toward China, the CTA could have praised the British government’s democratic and rational approach to resolving the question of whether (and how) two peoples stay together. It’s a shame this opportunity was lost. Additionally, when the Scottish pro-independence forces seemed to be on the verge of victory, the British government became nervous and decided to offer Scotland new autonomous powers if it stayed. It would be helpful to hear the CTA’s thoughts on this strategic dynamic, where pro-independence advocates actually helped the pro-autonomy camp as well. The CTA’s passivity has been especially pronounced on the World Summit of Nobel Laureates. When the South African government refused to issue a visa to His Holiness, the issue was simply one of standing up for His Holiness and the principles He represents. Although the Chinese government had pressured the South African government, the issue was safer since Beijing was not directly involved. Yet the CTA missed the chance to stand up for His Holiness. Instead, the charge was led by the Tibetan National Congress (TNC), which mobilized 10,000 people through a petition to the Nobel laureates to “relocate or boycott” the summit. Signatories on this petition included notable politicians, intellectuals, and artists. The F.W. de Klerk Foundation, one of the Summit organizers in South Africa, wrote that the TNC campaign “may lead to the cancellation of the Summit”. A few days later, the Summit was in fact cancelled when six Nobel laureates decided to boycott it (TNC called for relocation to Rome, and as of the date of this editorial, this looks likely). This was a major embarrassment for China, and a significant victory for the Tibet movement. It is especially significant that this was the third time that South Africa denied His Holiness a visa, but this was the first time the South African and Chinese governments received such dramatic blow-back. Unfortunately, the CTA leadership was silent on this entire issue until the day when the Summit cancellation was announced. That day, two Nobel laureates happened to be in Dharamsala on a long-scheduled visit timed with Mahatma Gandhi’s birthday. In fairness, the CTA leadership cannot be expected to do everything, and it must pick and choose what to prioritize. But it was disappointing that the CTA leadership thanked only the Nobel laureates for their boycott and for standing with His Holiness. While these Nobel laureates indeed deserve the Tibetan people’s deepest gratitude, the de Klerk Foundation made clear that TNC’s campaign was directly responsible for the Summit cancellation. Even if the CTA leadership was uncomfortable recognizing TNC’s role for some unknown reason, at the very least there should have been recognition of the petition’s prominent supporters, who put their names on the line to stand with His Holiness. The Kashag’s declared emphasis on “civility” should include a simple “thank you” when appropriate and give credit where credit is due. We agree fully with the Sikyong’s statement. Our observations of some missed opportunities by the CTA leadership stem from our fervent wish to see the Tibetan government-in-exile succeed. Like the Sikyong, we believe that a vital part of democracy is the people expressing their views about the performance of their elected government, and this editorial aims to play a small part in that.